When it comes to cleaning your house, no tool is as versatile or as reliable as a vacuum. Whether you have carpeting, hardwood, or some combination of both, a decent vacuum cleaner will make the job much easier and more rewarding. However, with so many different brands out there, how can you be sure which one will be the best for your needs? Today we’re going to look at one company in particular: Oreck. This brand has been around for decades and was one of the first to bring personal vacuum cleaners into the mainstream. This dedication to delivering high-quality cleanliness is still alive and well today in all Oreck products, which is why we are focusing on them here. Nonetheless, there are still differences between the different models so it’s important that you pay attention to the various features offered so that you can be sure that you’re getting a vacuum that’s right for your home. 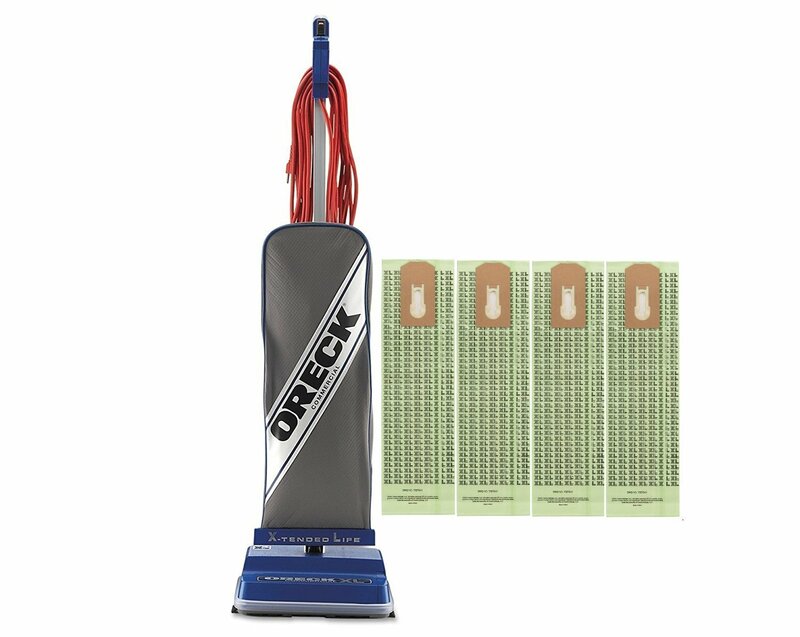 Starting our list is this classic Oreck Upright Vacuum. The Commercial XL2100RHS is the gold standard from the company, meaning that you get reliable and efficient performance every time you use it. It has a wide base to make your cleaning procedure go much faster, and it has a slim profile so that you can store it almost anywhere. Also, it only weighs eight pounds, which makes it a breeze to take up and down stairs if necessary. What we like most about this vacuum is the powerful suction. A double-helix brush roll spins at 6500 rpm, which means that it can collect a ton of dirt in a short period. On top of that, it comes with hypoallergenic dust bags that are easy to change so you can ensure that your air is as clean as possible. Overall, if you’re looking for a decent vacuum, this is it. Usually, when looking at canister-style vacuums, they are full-size models that can clean floors easily. 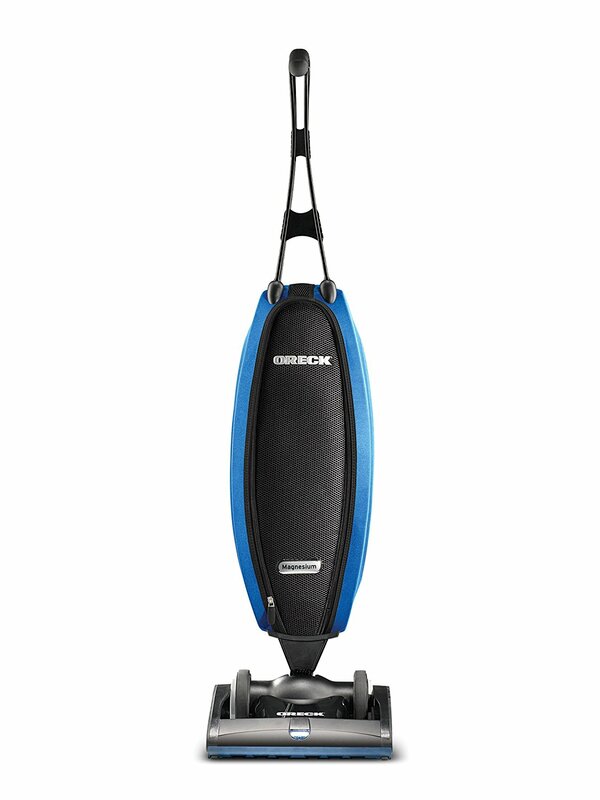 In this case, though, the Compact Canister Cleaner from Oreck is designed to be more portable and lightweight than anything, so don’t expect to use it on your carpets or hardwood, unless you like working on your hands and knees. That being said, this vacuum can work wonders on all the other parts of your house where a full-size unit wouldn’t fit. Furniture, stairs, or tight spaces are all ideal spots for this vacuum to go, and since it weighs less than five pounds, you can carry it with you anywhere. The other excellent option for this model is using it as a car vacuum rather than going to a car wash and paying extra money. Best of all, this particular unit can be reversed to use as a mini leaf blower if necessary. Overall, you can do a lot of work with this vacuum that would otherwise be impossible with a standard upright or canister model. Next, we have yet another upright vacuum that is both classic and reliable. The UK2200 has a lot of the same performance features as the XL2100RHS, although this particular model has a few key distinctions that separate it from the one above. While both of them are excellent at suction and raw power, this one is a more basic model, meaning that you don’t get as many added features. That being said, if you’re looking for a simple and effective workhorse in your house, then this vacuum can be your best friend. It is larger than most other models, which means that it can work longer and better than the competition. Not only that, but it uses Oreck’s proprietary SaniSeal system that traps dirt and allergens and keeps them from spitting back out into the air. Finally, it has a wide, flat base that can navigate underneath furniture easily. Overall, this is an excellent choice for any household that has a lot of carpets to clean and doesn’t care about a lot of bells and whistles. While the UK2200 above is a workhorse, this LW100 Magnesium SP Vacuum from Oreck is a prize stallion. Looking at this model, you’ll see that it has a much more sleek and modern design from the others, and it comes with some bonus features that will make your life easier. First of all, this is a super lightweight cleaner. It weighs less than eight pounds, which means that if you have a multi-story house, then this can be a welcome addition to your cleaning supplies. The secret is the magnesium frame that is both durable and lighter than traditional models. Secondly, the power is incredible, and it adapts to your floor automatically so that you can go from carpet to hardwood without having to switch anything or push any buttons. It comes with a dual-speed motor that works well on high-pile carpets as well as flat surfaces. Finally, it comes with a remarkable filtration system that traps dust and allergens like nothing else. The bags are sealed so that they don’t explode when you change them, and they are super easy to install. Overall, if you want a high-quality vacuuming experience, this is the one to choose. Our final stop is with another portable canister vacuum. However, unlike the one above, this is designed for commercial use, meaning that you can do a lot more with this model than you could with most other portable vacuums. The secret to this unit’s performance is the two-stage bypass motor. Most handheld models have a single-stage system, which can break down much faster. 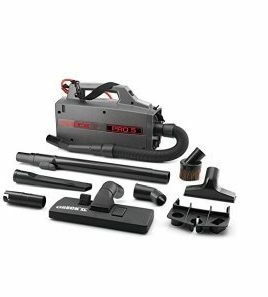 The other primary difference with this vacuum is that you get a wealth of attachments that can make your life so much easier. Whether you’re cleaning the house or your car, you can do so much with this system. Best of all, it uses Oreck’s standard hypoallergenic bags so that you never have to worry about dust or allergens again. When looking at vacuums in general, there are two primary types from which you can choose. The most common is the upright, which most people are familiar with, but you can also get a canister-style model as well. Upright vacuums are great because they are easy to use and can work almost anywhere. They are limited, however, in that you can’t clean all surfaces without using a hose and attachments. Even then, it can still be tricky to get a deep clean. 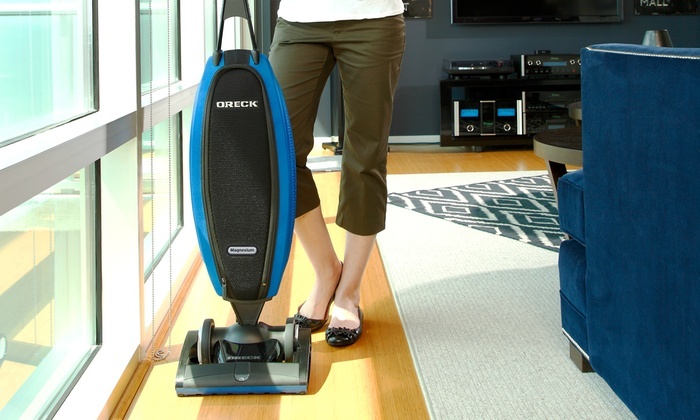 Canister vacuums have much more flexibility and can work on floors, furniture, and stairs with ease. The biggest downside to these, however, is that they can be harder to move from room to room as you have two components instead of one. Overall, this may come down to personal choice, or it could be dependent on the type of vacuuming that you do the most. As you will see, sometimes you can get a handheld vacuum to supplement your standard model. These smaller units enable you to clean virtually any surface, including ceilings and corners, with ease. As for a floor vacuum, you want to make sure that it is large enough to make the job go by faster, but not so large that it can be heavy or cumbersome. Overall, you want to ensure that you get the right size for the job. 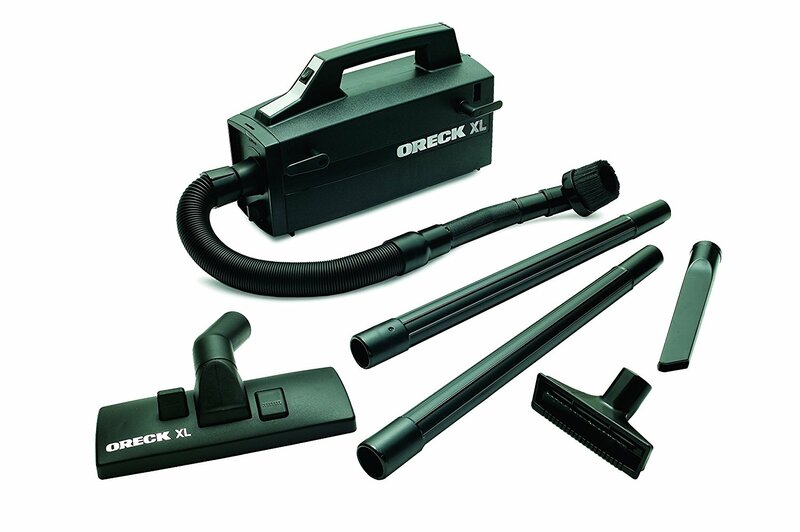 When it comes to Oreck Vacuums, most, if not all, of them come with bags to collect the dirt and debris from your home. Many people like having bags because they are easy to dispose of when full, but they do have a couple of limitations. First, you have to make sure that you have plenty on hand for when you run out. Second, they can limit the amount of suction you get as they fill up. For that reason, bagless vacuums are becoming more popular, but they are not without their own problems either. Bagless models can be hard to clean, meaning that you could wind up with a dust cloud every time you try to empty the canister. The benefit, however, is that you never have to worry about a loss of suction or paying extra for new canisters. Overall, it will come down to personal preference over anything. As we mentioned, though, each of the models we’ll see today have bags installed, so that is something to keep in mind. While the base vacuum is excellent for cleaning your floors, what about the rest of your house? If you want to keep your furniture and other surfaces clean, then you’ll need accessories to attach to the vacuum hose. Most units come with a few attachments, but it’s important that you get ones that you will use on a regular basis. For example, an extension wand is ideal for high spaces and furniture cracks, and a brush attachment can work wonders on furniture and stairs. Overall, the more accessories you get, the more versatile your vacuum can be, so take that into consideration when making a final decision. When looking through these various vacuum cleaners, it’s hard to pinpoint one specific model that stands out from the rest. The reason for this is that you may want both a full-size and a portable unit, which means that you might need to get two different models. With that in mind, we would highly recommend the LW100 model as a floor cleaning vacuum, and the BB900DGR XL model for your portable needs. The LW100 is perfect for cleaning almost any carpet or hardwood, and its innovative design makes it easy to use in any household. As for the portable canister model, we like the powerful motor and extra attachments that come with it. It is one of the most versatile vacuums you can find, even though we would like it better if it could clean the floor as well. If you use both of these units in tandem, you can get your whole house (and car) clean in no time.